Sergeant Jimmy Browne knows what it’s like to be in hospital with a sick child during the festive season. Seven years ago, his son spent 10 days in the Hospital for Sick Children Intensive Care Unit. He was able to come home on Christmas Eve. 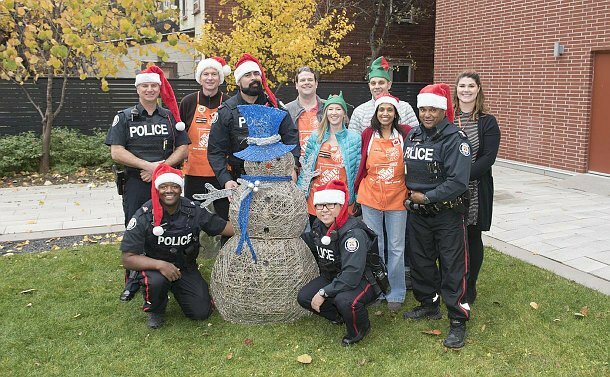 When Brown learned that officers from the 52 Division Community Response Unit were going to help decorate Ronald McDonald House on December 1, he immediately put his hand up to be included among the group of volunteers. The House serves up to 81 families to be able to stay near treatment at the Hospital for Sick Children. Browne, along with Constables Nam Le, Juan Delgado Meneses, Anthony Lamanna and Gregory Seaforth, joined Home Depot employees for a few hours to set up Christmas trees and install decorations inside and outside the building where families and sick children get a chance to heal together. Home Depot also brought 80 bags of gifts for the children. Not to be outdone, the 52 Division officers brought colouring books and toys for the kids. “Most of the kids here are not going home for the holidays, so we hope what we have here, and what we are doing today, will bring some smiles to their faces,’” said Le, who has been at 52 Division for the last 16 years. Ami Armagost, the Ronald McDonald House program director, thanked the officers for their support.